Indonesia Teak Outdoor Furniture, Indonesia has been called as furniture manufacturers for international market for many years now. The bliss of the country is sourced from the natural resources that the native could use for the sake of functional daily products. It is also happened in furniture products, as there are many of natural resources that easily can be transformed into them. In regards to furniture varieties, the main is divided into indoor and outdoor furniture. By the country’s available varieties, the manufacturers are able to produce kinds of materials for kinds of areas usages. For instance, they have natural fiber made of rattan, bamboo, water hyacinth, or sea grass, which they are great as indoor furniture for any rooms. While teak wood is great as both indoor and outdoor furniture for its distinctive characteristics compared to the other natural materials. In term of teak as furniture, the wood itself has unique charateristics to somewhat be great as outdoor furniture. However, we need to learn about the wood at first as it is divided into three grades. Looking into the first and second grades, A and B, they are the most quality to become outdoor furniture even in extreme weather such as in four-season countries. Both grades are well planted in legal plantations managed by PT. PERHUTANI, own state forestry management company. The last grade will be the C one, the lowest in quality and most flaws on the wood surface that came from ordinary plantations. Then if it is happened as quality outdoor furniture, Indonesian teak wood will be great to decorate any spaces such as garden, lawn, decking, yards, or patios. Indonesia teak wood has its rich honey brown color, dense grain, and natural oil contents. The combination among them is perfect as company in every outdoor activity. 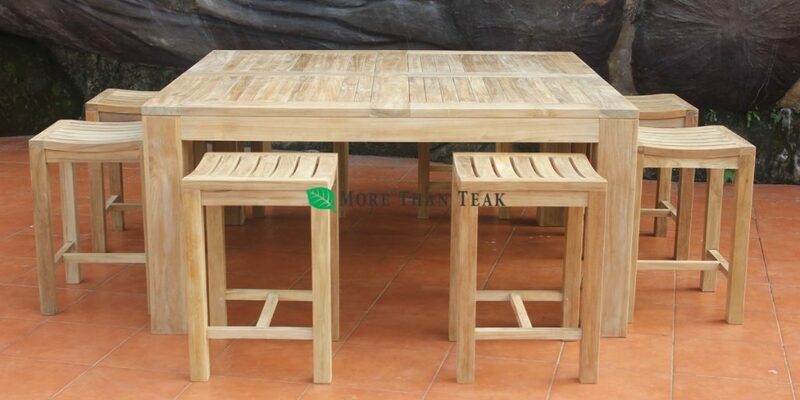 In summer time, a teak outdoor dining set will cover BBQ party with friends and member of families, relax and sincere moment of book reading on stylish deep seating or sunbathing with sun lounger made of teak. Those are moments that cannot be avoided once people already attached with Indonesia teak outdoor furniture for their own. This entry was posted in article and tagged Indonesia Teak Outdoor Furniture.